Paul was born and raised in Rosenberg, Texas where his interest in wildlife and conservation developed on the Texas coastal prairie. In 1998, he earned a Bachelor of Science degree in Biology while attending the University of Texas at San Antonio (UTSA). During his time at UTSA, his deep interest and passion for birds of prey began while working at a local San Antonio raptor rehabilitation and education center called Last Chance Forever, The Bird of Prey Conservancy. In 1999 he moved on to pursue a graduate degree and was accepted into the Wildlife Ecology program at Southwest Texas State University in 2000. His thesis work focused on the winter ecology of Peregrine Falcons on South Padre Island, Texas which earned him a Master of Science degree in Wildlife Ecology in the fall of 2003. He began working for The Peregrine Fund as a biologist in February 2003 and focuses his efforts on the Northern Aplomado Falcon Restoration program and on the research and conservation of Golden Eagles. 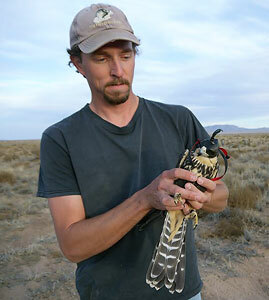 Outside of his career, Paul is an avid falconer who also enjoys hunting, fly fishing, and bird watching.